Jilin Songjiang Carbon I/E Co., Ltd. (JLSJC for short,logo:JSC) is located in Jilin City, Jilin Prov. Fronting twist and turn of the Songhua river,back to the good-geomantic scenic Beishan Mountain. JLSJC is a professional international-trade company. Our company implements standardization management and have attained ISO9001 QMS certification. Main products are graphite electrodes, graphite powder,graphite blocks and other carbon products. All products of JSC meet international quality standards, are exported to Asia,Europe, South America, Africa and other more than 30 countries and regions, enjoy a good reputation at home and abroad. 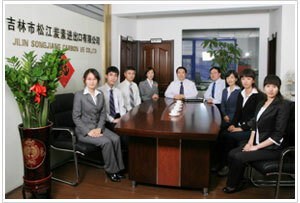 In 2004, the company restructured establishment from Jilin Songjiang Carbon Co.,Ltd. , after nine years down to earth, arduous operation, developed into both have entity industry and international trade business ability enterprise. It’s annual turnover of 150 million yuan, with exports amount to more than 20 million US Dollars. Carbon products exports quantity is among the best in the country. All above achievements, thanks to our unique four big advantages: ◆ Strong supply support capabilities◆ Perfect quality control support capabilities◆ Excellent cost performance◆ Fast high quality service Today is undergoing extensive and profound changes in the world, foreign trade enterprises integrating into the international economic system, are also facing a rapidly changing market, JLSJC will pursue the tenet "customer-centered,employee-based" as enterprise purpose, the perfect service as our core products and competitiveness, to maximize the interests of customers as the starting point of our service and all actions. Provide the most excellent products, the most favorable price and the most perfect service to all customers. We warmly welcome global customers to establish cooperation and create a bright future together with us.